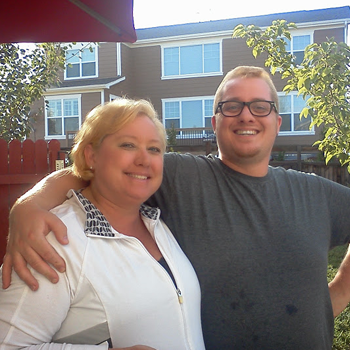 Chef Ryan and his mom right before they both shaved their hair. When I found out that my mom had cancer, I was living in College Station, Texas. I had been receiving phone calls from my mom detailing the progress of the testing. And this time, the phone call was to tell me that she had a form of breast cancer that they call DCIS. She informed me that it was nothing serious to worry about and that she would have to undergo a simple surgery referred to as a lumpectomy. I knew in my heart that this wasn’t going to be as simple as it seemed. My wife Jessie and I effectively dropped everything and made preparations to move back to Colorado to help take care of my mom. After returning to Colorado, I went to every doctor’s appointment that I could go to so I could better grasp the nature of the situation. My mom and I met with the oncology team, surgical team, and the reconstruction team before the surgery. It seemed like every meeting that we had uncovered new worsening things everyday. During surgery, it was decided by the surgeon that she needed a full mastectomy on one side and a lumpectomy on the other side. When the testing came back after the surgery, it was found that the tumors were HER2+ and with the rapid changing, advancement, and growth of the tumors over the course of 3 months, it was decided that 6 regimens of chemotherapy would be necessary. It seemed to me to be this constant blur with each day bringing worse and worse news from something that was originally discovered to be not much of a threat to progress to something that could threaten my mother’s life: CANCER. As I look back now, a few years later, I could never have imagined that picking up the phone that day would lead me onto a journey that would be the hardest one in my life. After my mom healed from surgery, we began the chemotherapy process. The oncology doctor and staff were wonderful and gracious. But, it’s a very strange feeling to know that somebody is smiling while they effectively poison someone you love to death. There’s an old saying that sometimes you have to fight fire with fire. And strangely enough, fighting cancer is one of those circumstances. We did everything we could to prepare for chemotherapy. We visited with cancer support groups, nutritionists, dietitians, and even a cancer foundation, who was gracious enough to lend my mom some new hair for when hers fell out. Truly though, nothing you can do can prepare yourself fully for what happens during chemotherapy. After the first cancer treatment, my mom had trouble with extreme nausea and dizziness to the point of where she fainted in the bathroom and almost seriously injured herself. Seeing my mom in that position was an absolutely horrifying experience and that is putting it lightly. Once we figured out how to balance her medications against her chemotherapy side-effects, we were able to better mitigate the discomfort she was experiencing. As I had seen before with both of my grandfathers and my best friend Tommy, all of whom had cancer and underwent chemotherapy, she too began to find that all food and beverages began to taste metallic. Luckily this is one chemotherapy side-effect that I did anticipate and was familiar with. With everything tasting metallic and having a genuine fear that my mom would undergo the same starvation as my other loved ones did when they were diagnosed with cancer, I swore that I would do whatever it took to make food taste good for her again. I cooked every meal for my mom and stayed home every day as her cancer caregiver, doing every task from cleaning the house to washing her clothes and everything in between. 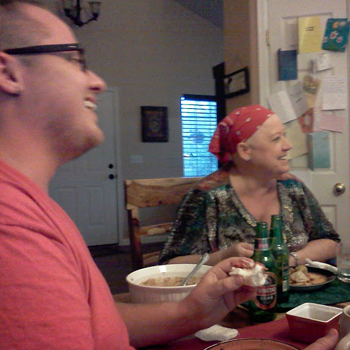 Chef Ryan Callahan and his mom enjoying a spicy and flavorful meal that he cooked during cancer treatment. The hardest part about being a cancer caregiver is watching the person you love’s transformation from looking normal and healthy to looking like victims of war. All the while keeping on a brave face and smiling so that they don’t know how much it hurts you to see them hurt. Eventually, I was able to come up with a schedule of how I did things everyday and find a little bit of “me” time to keep me sane. I will say that one of the hardest obstacles to overcome for a person as sociable as I am was the constant feelings of isolation that cancer causes. My natural fear of large groups of people became overpowering to the point of where I would have panic attacks while grocery shopping from the amount of people that were suddenly thrust into my path. Even though there was all of this bad cancer stuff, there was good that came out of it. In times of crisis, you truly find your own strength. As fire creates steel, the repeating hammer blows of tragedy forge you into a new and stronger being than you could ever imagine. It was somewhere after the second dose of chemotherapy that I was able to finally figure out the techniques that would allow my mom to eat while in the midst of cancer treatment. It was so simple too. It was just like one of those moments where a light bulb goes on in your head illuminating an idea that aligns all of your thoughts and knowledge into one simple concept that you realize that you had known the whole time. Jumping back a little bit, when I was in Texas. I was working for some family friends who owned and operated the Chinese restaurant that I basically grew up in. I had gone to traditional culinary school and I had cooked many western forms of cooking. But, it was there in that dingy 2000 sq ft Chinese restaurant in a strip mall that you couldn’t even see from the road, that I learned the secrets of Chinese cooking. Chinese cooking always consists of a few parts: a salty savory aspect, a spicy aspect, a sour aspect, and a sweet aspect. These were manifested physically in the following ingredients: soy sauce, spicy chilis, rice vinegar, and sugar. To the layman, these seem like very simple ingredients but to those who understand the essence of flavor, you can use these ingredients in varying proportions to create an almost infinite palate of specialized sauces and flavors. It was when I was preparing chicken and dumplings for my mom that I finally truly understood how the flavors were interacting and what was physically happening to my mom’s senses. The chemotherapy to fight her breast cancer was killing her sensory cells, diminishing her ability to smell, and drastically reducing the sensory ability on her tongue. Whether this is from dehydration, cellular death in the nervous system or some other mechanism, I truly do not know. But, what I was able to discern and come up with was a practical culinary theory which I call Roundness of Flavor and a practical technique I call Palate Cleansing. Roundness of Flavor teaches you how to handle and hold in balance your 5 flavor senses. Palate Cleansing is a simple cooking technique that allows you to clean the mouth out and reset your mouth after each bite by utilizing a subtle but imperceptible sour note. If my mom had never been diagnosed with breast cancer and forced to undergo chemotherapy treatments, I would not have been able to write my cookbook or help as many people as my cookbook and recipes will end up helping. I truly believe that my cookbook will help every cancer and chemotherapy patient if their caregivers are willing to put in the time to learn these easy to understand cooking techniques. Sometimes, it takes a tragedy like cancer to learn who you truly are and to push you over the edge. Not everybody comes out better and many people come out worse for wear. But I was blessed enough to be able to look into the face of darkness and still find the beauty within. 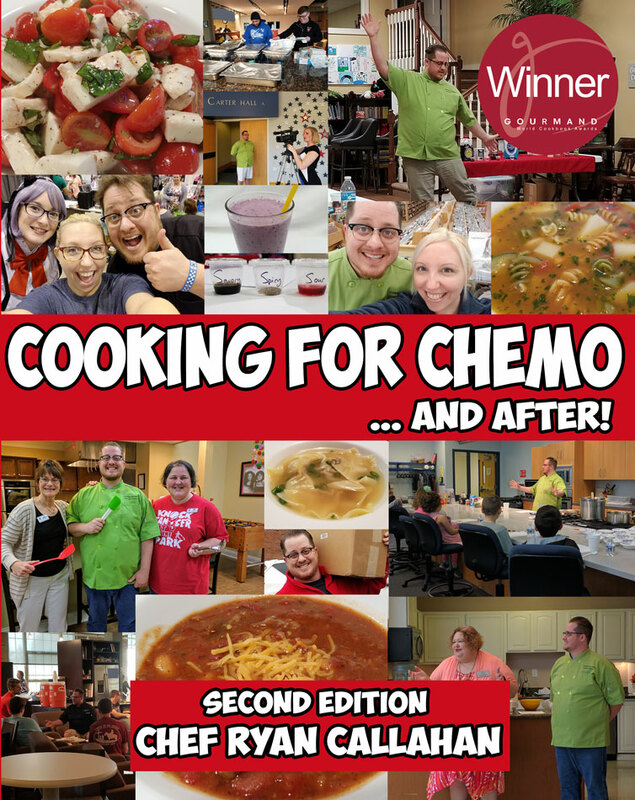 Click here to learn about: What is Cooking for Chemo?